Blended Learning is in the top 10 of methodological innovations among the education sector. This is because traditional teaching methods are outdated. Students increasingly demand more interactive ways of learning and the usage of technology as a learning tool. Blended learning means joint learning or mixed learning. It’s a perfect combination between face-to-face teaching, and online learning. Hence why it’s spreading among the education sector, as it allows teachers to bring elements from online learning into a face-to-face field instead of simply using digital tools as a supplement to the course. Dexway Companion courses were designed by Computer Aided Elearning with this aim. The plan is to not only work as a complementary digital tool, but a flexible tool that adapts to any teaching plan, and to the student’s particular needs, with loads of advantages to both teachers and students. Dexway Companion courses encourage students to continue learning outside the classroom thanks to the materials and activities they can access to reinforce what they’ve learned in the schoolroom. These are dynamic, interactive and fun activities, so that the student feels motivated and develops autonomy. Furthermore, the CAE e-learning software allows both teacher and student to have access to their personal progress, or the teacher can see how the whole class is doing and use it as a guide to know which concepts have been understood and which ones need to be practiced, being allowed to do it without modifying the pace of the course. #1. Organise the course according to your demands. The Authoring tool allows to modify and reorganize the contents according to the needs of the students. With this, it will not be necessary to change the teaching plan established at school, but it will have a digital support 100% adaptable to the face-to-face classes. The teaching staff can choose the order of the syllabus, establish the goals of each unit and block the contents they don’t want the students to access yet. They can choose rather if they want the students to work on the theory before the class or to do the support exercises once the concepts have been explained by a teacher. #3. Get the best out of the face-to-face classes. Encourage the students to practice the concepts through the e-learning platform so that you can optimize the classes with dynamic group activities to develop other skills. Complete online training session with a discussion forum. Create a personalized plan of specific contents for each student. Work some content on a face-to-face class and complete it with interactive exercises on the platform. The most positive thing about Dexway’s materials is that they follow an interactive, dynamic and complete way of learning which means effective, fun and integral learning. 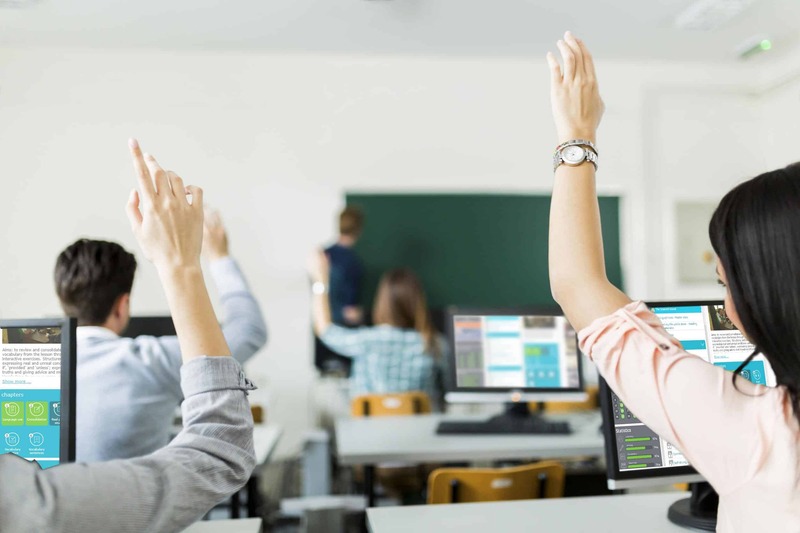 Students learn all the contents and the teacher has an e-learning platform available that gives essential support to their classes, turning it into an unforgettable experience for the students.